Business Economics and Managerial Decision Making is an essential introduction to business economics. A core textbook for students with a grounding in introductory microeconomics, it examines the nature and structure of the firm, and explores the economic principles underlying major business decisions. This accessible text avoids overly mathematical analysis, using diagrams, graphs and tables to explain economic theory. Trefor Jones draws upon current research and real-world examples from around the globe to illustrate the practical implications of economic theory for the business of the firm. In addition, a major chapter-length case study of a single enterprise (Stagecoach plc) provides an integrative real-world analysis of the core concepts and major theories developed throughout the book. Extending the approach traditionally taken by business economics texts, Trefor Jones introduces material on the boundaries of the firm, including its growth and development, diversification and mergers. 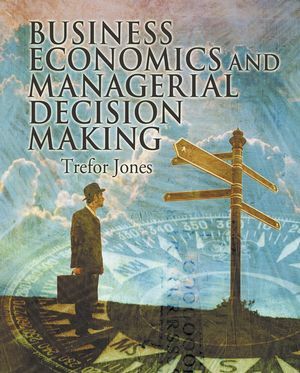 Trefor Jones currently teaches economics at the School of Management at UMIST. He has significant experience of teaching at undergraduate and postgraduate levels both in economics and business/management environments. I. Corporate Governance and Business Objectives. 1. Ownership control and corporate governance. 2. Business objectives and theories of the firm. 6. Estimation of demand functions. III. Understanding Production and Costs. IV. Pricing, Promotional and Investment Policies. 9. Pricing and market structure: theoretical considerations. V. Strategic Decisions: The Growth and Development of the Firm. 13. The entrepreneur and the development of the firm. 14. The boundaries of the firm. 15. The growth of the firm. 16. Changing the boundaries of the firm: vertical integration. 17. Changing the boundaries of the firm: diversification. 18. Changing the boundaries of the firm: divestment and exit. 19. Changing the boundaries of the firm: mergers. 20. Organizational issues and structures. 21. The growth and development of the firm: Stagecoach Group Plc. VI. Decision Making in the Regulated and Public Sectors. 22. Decision making in regulated businesses. 24. Quasi-markets and non-market public sector. Provides a combination of internal-firm material, strategic issues, and material on regulated industries. Covers decision making of the firm in relation to the market. Covers decision making in both private and public sector organisations. Examines the role of managers in organisations. Examines the responsibilities of managers to owners and/or stakeholders. Includes topical case studies e.g. Manchester United PLC and Stagecoach Buses.